This paper deals with topology optimization seen from an industrial and a manufacturing point of view. What the industrial users see as key issues when implementing topology optimization are frequently not the topics that the academic environments consider when implementing topology optimization. One of the key issues is that topology optimization should be integrated into an existing CAD and CAE environment (example of FE-solvers: ABAQUS, ANSYS, CATOPO, NX Nastran, MSc Nastran, MSc Marc and Permas). Here, it is of importance to note that the models analyzed in the industrial CAE environments often consist of many finite elements (can be more than 2 million elements) and different types of elements (continuum, beam, membrane, shell, bar and rigid elements) which all can be employed in the same model. Furthermore, symmetry and manufacturing constraints are important for ensuring that the results of the topology optimized are manufacturable. 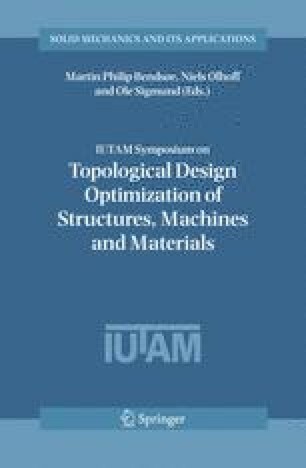 Several examples will be given of how structural topology optimization can be used as an add-on module in existing CAE environments However, from an academic point of view an add-on module including topology optimization for commercial FE-solvers is also of interest because the latest finite element and solver technology can be applied in the modeling for the topology optimization. Furthermore, the aim is also to show where the industry is today and which demands exist for the future. The results reported here are based upon the work done by FE-Design and their industrial partners using the topology optimization module (TOSCA.topo) and smooth module (TOSCA.smooth) of the program TOSCA.